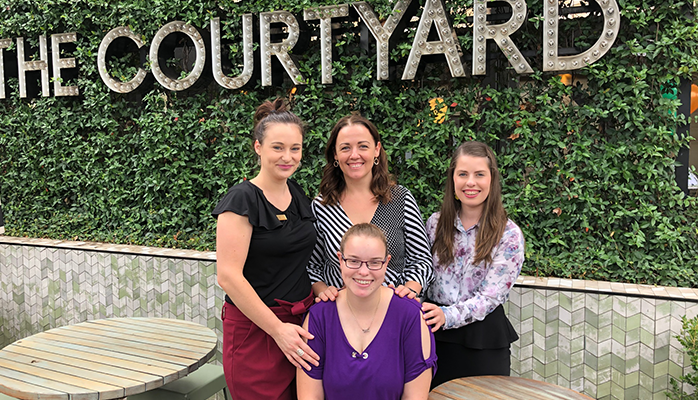 On Wednesday, Allara Learning held a ‘Meet the Employer’ morning tea at Lewis Land Group venue The Fiddler, to allow JobActives to learn about the hospitality employment opportunities they have available to local job seekers. The morning tea brought together JobActives and representatives from the Department of Employment to hear about the success of the JobReady programs Allara Learning has run with The Fiddler. Allara Learning JobReady programs help employers find job seekers and provide them with pre-employment hospitality training to equip them with the skills and work experience required for specific roles within their business. Attendees heard from The Fiddler Human Resources Manager, Alina West, and Duty Manager, Tara Bonser, about the fantastic employees their venue has gained through the JobReady programs they have run with Allara Learning. JobActives gained insight into how the program can support and cater to the changing needs of jobseekers, hearing from Tracey Evans-Harvey, a candidate who overcame many obstacles including her disability to successfully complete her training. Since completing training, Tracey has become a valuable team member at The Fiddler, gaining newfound confidence and independence through her employment. The morning tea allowed JobActives to learn about the various hospitality jobs available within The Fiddler and Lewis Land Group’s new venue Camden Valley Inn. A tour of The Fiddler also gave JobActives the opportunity to learn more about the venue and culture at Lewis Land Group to see which of their clients would be a good fit. JobActives were enthusiastic about the program, and were excited at the prospect of working with The Fiddler and Allara Learning. The Department of Employment were extremely impressed with the employment outcomes Allara Learning and The Fiddler have achieved to date through the JobReady program, and look forward to the program’s continued success. Learn more about Allara Learning’s JobReady programs here.